During its breeding season, from early June to early September, the Greater Snow Goose lives in the high arctic tundra near the coast or inland on rolling terrain or in low-lying wet meadows with many grasses and sedges. During the winter along the United States Atlantic coast, it frequents marine inlets and bays, marshes, coastal prairies, and cultivated fields. 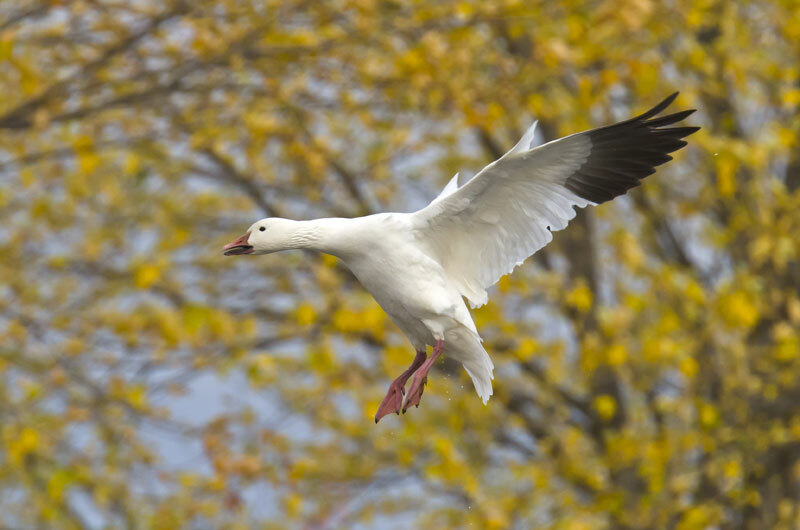 The Greater Snow Goose moves very well on land, on the water, and in the air. It is a good walker. On Bylot Island, Nunavut, the world’s largest Greater Snow Goose breeding colony, the distance between the birds’ nesting and breeding sites is more than 30 km. Within a day of hatching, many young geese set off on this trek with their families, reaching their destination within four days. As an adult, a Greater Snow Goose can outrun most predators when it is moulting and cannot fly. It swims well, and while it does not dive for food, it will dive short distances if it is threatened. As for flying, this goose usually travels at about 55 km/h, is capable of reaching speeds of up to 95 km/h, and can make long nonstop flights of up to 1 000 km. The Greater Snow Goose is dimorphic, meaning that it appears in two forms. 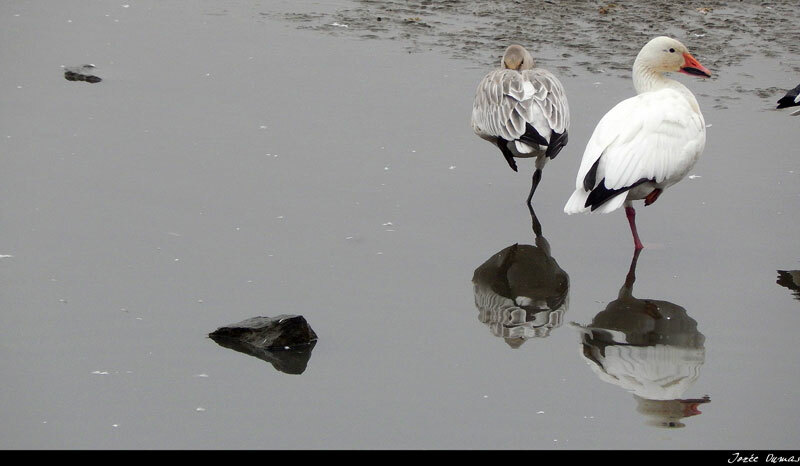 Most Greater Snow Geese are called light morphs: they are white. Some are called dark morphs, or blue, geese: most of their feathers are blue-grey. 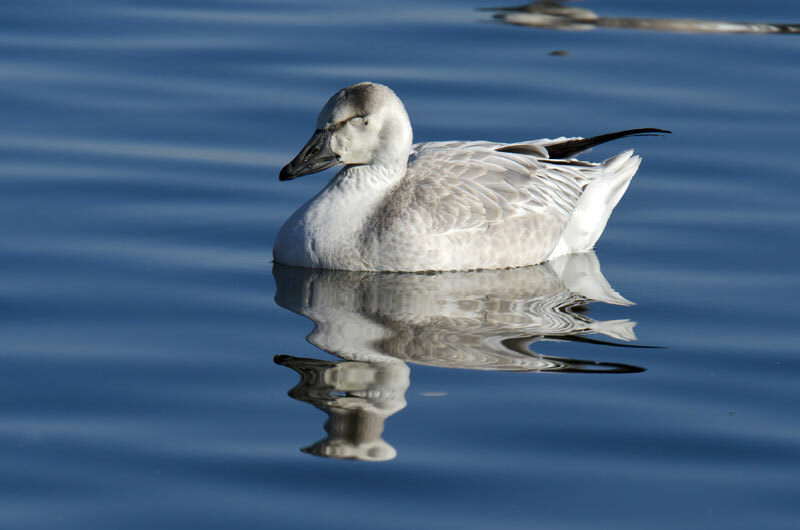 The blue morph, which is quite common in Lesser Snow Geese, is rare in Greater Snow Geese: fewer than 4 percent of Greater Snow Geese are of this blue phase. Blue morph geese tend to mate with blues, and whites with whites. Only one population of Greater Snow Geese exists in the world. 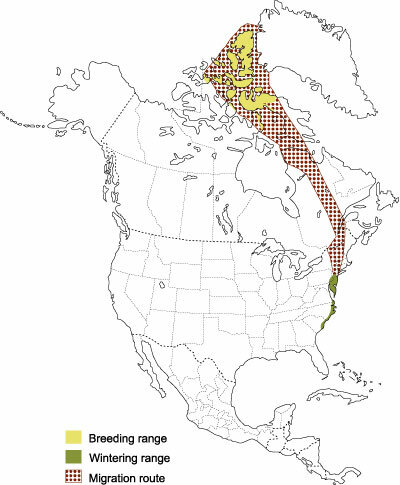 It is almost entirely confined to the Atlantic flyway of North America. Greater Snow Geese breed in the Canadian High Arctic, from the Foxe Basin to Alert on northern Ellesmere Island. Some breeding colonies can also be found on the western coast of Greenland. This makes the Greater Snow Goose one of the most northerly breeding geese in the world. It winters along the United States Atlantic coast, from New Jersey to South Carolina, with major concentrations around Delaware and Chesapeake bays. Greater Snow Geese undertake longer migrations than most other North American geese: they usually travel more than 4 000 km. In spring and fall, they fly in flocks of families and individuals, travelling day and night. The spring flocks are smaller than the autumn ones: between 35 and 400 birds fly together in the spring, whereas more than 1 000 can travel together in the fall. In Canada, the Greater Snow Goose migration follows a corridor between the eastern seaboard and the eastern Arctic. 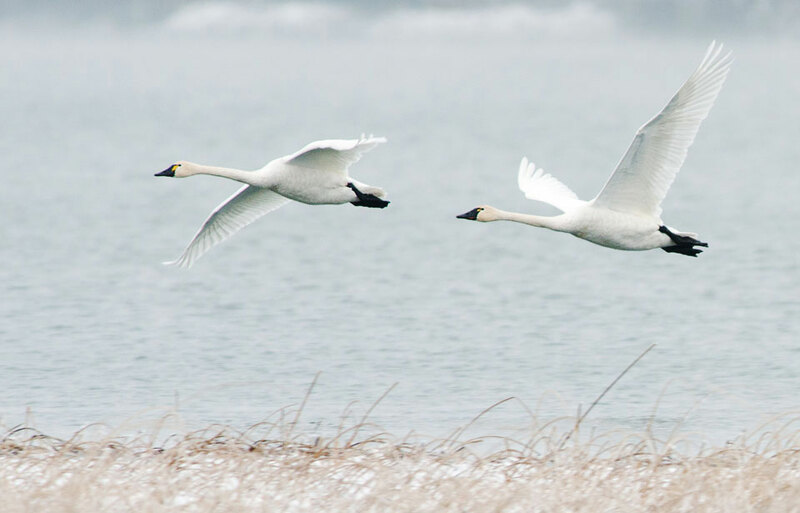 The spring migration begins in March, and the first geese arrive in the St. Lawrence River area by the first week of April; the last leave on the final stage of their northward journey by May 25. The entire population of 700 000 to 800 000 birds stages, or gathers, in a few localized areas, making their migration a most spectacular event. 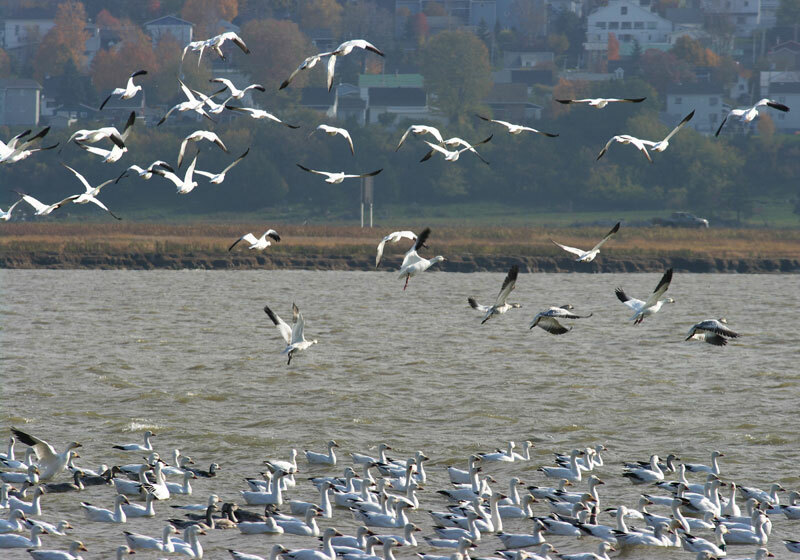 Striking concentrations of more than 500 000 Greater Snow Geese can be seen in early April at Baie-du-Febvre, on the south shore of Lac-Saint-Pierre, between Montréal and Trois-Rivières. Large groups of geese also gather at Cap Tourmente, Quebec, about 60 km east of Quebec City, from about April 25 to May 20. In the fall, the birds leave the Arctic breeding grounds in early September, when the soil and freshwater ponds begin to freeze, journeying more than 1 000 km during the first segment of their odyssey. This takes them rapidly southward across Baffin Island to the central portion of the Ungava Peninsula in northern Quebec. There, they stage for several days, moving between many sites. The second major part of the migration occurs when the birds are close to the tree line. Once again, they fly more than 1 000 km, following the boreal forest to the St. Lawrence River, where they arrive during the first half of October. About 80 percent of the geese stay there an average of 19 days—with the greatest concentrations from October 5 to 20—to replenish the energy reserves they need to continue their migration in early November to their wintering grounds in the United States. The geese that do not stop here fly directly to the United States Atlantic coast. Since the 1970s, an important change has occurred in the way the Greater Snow Geese use the St. Lawrence staging area. The geese used to stage almost exclusively in the bulrush marshes near Quebec City before heading north in the spring, and flying non-stop to their wintering grounds in the fall. Now, in the spring, they gather at the Lac-Saint-Pierre and other sites, moving west to east along the St. Lawrence River, before they head north. 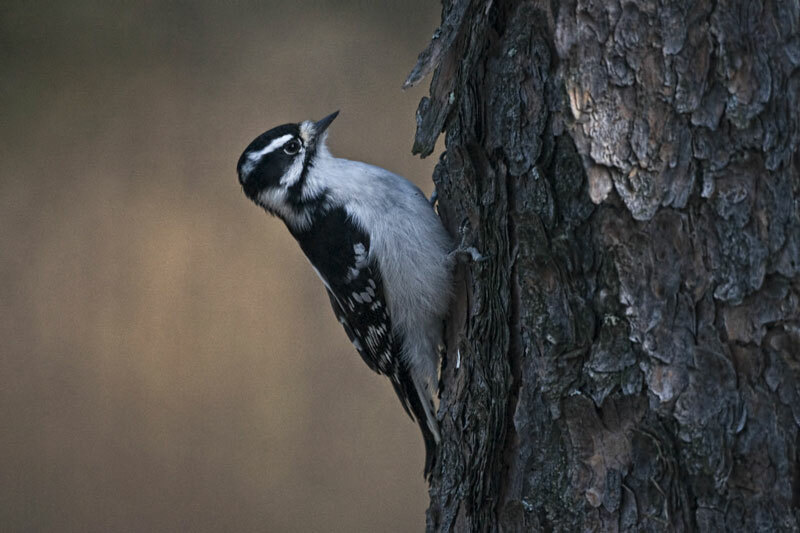 In the fall, the birds disperse from the Quebec City area in late October and move a short distance southwest towards Lac-Saint-Pierre or northern Lake Champlain, where they feed in corn fields and where some remain well into November and December. Wildlife biologists have also noticed greater use of the more northerly Lac-Saint-Jean area in Quebec since 1995. The Greater Snow Goose is herbivorous, eating only plants. At the breeding grounds, it feeds on the roots and leaves of a large variety of grasses, sedges, and other plants 24 hours a day in the Arctic’s round-the-clock summer daylight. Near the St. Lawrence River, it feeds primarily on the rhizomes, or roots, of bulrushes. Its strong, sharp bill is effective for digging the roots from thick mud. The snow goose also forages, or searches for food, in farm fields, where it feeds on waste oats and corn or grazes on grass, weeds, and clover. On the wintering grounds, it feeds on the roots of cord grass and other aquatic vegetation, but the goose is also found on farmland feeding on corn, soya, or winter wheat. 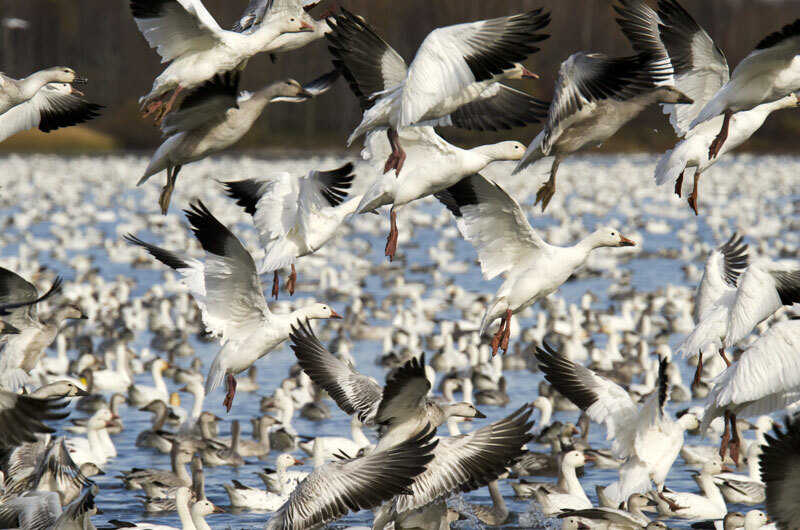 Often, the Greater Snow Goose will forage in large flocks of 1 000 or more. The Greater Snow Goose breeds farther north than most other North American geese in small, loosely associated colonies. Like most geese, Greater Snow Geese do not start breeding before they are two years old, and some even delay their first breeding attempt until they are four years old. They mate for life, taking another mate only if their partner dies. The geese arrive at their breeding grounds in early June, having paired elsewhere. Approximately 10 days after arriving, they build their nests on dry hummocks within wetlands and on hillsides and the protected slopes of ravines. The female selects the nest site, and only she builds it, although the male remains in the vicinity. The nest is usually concealed in a shallow depression in the ground and constructed of bits of dry vegetation that the female finds in the immediate area of the nest. She may lay her first egg within an hour of selecting the site, and as she lays more eggs, she may add nesting material, including a lining of down from her breast and belly. The female has one brood, or set of young, in a year. She lays one egg every 36 hours, and usually lays a clutch of 4 or 5 eggs. She begins incubating, or warming, the eggs when the second-last or last egg is laid, and during the following 24 days of incubation, the male stands guard, seldom straying more than 50 m from the nest. The female leaves her nest to feed several times a day, usually for about 15 minutes at a time. Unless she is frightened away, she always covers her eggs with down from the nest before she leaves it. This serves both to camouflage the eggs from predators and to keep the eggs warm until she returns. Hatching takes place in early to mid-July. When the goslings leave their nest approximately 24 hours after the last egg has hatched, they can walk, swim, dive, and feed. They weigh about 100 g at birth and grow rapidly. Six weeks later they begin to fly. By then they weigh about 2 kg and have lost their yellowish natal down and acquired their grey and white juvenile plumage. They are ready for the southward migration by the first week of September. Both parents care for their young for an extended period, often for one year or more. There are always nonbreeding birds in the flock. Birds that normally breed can skip breeding in a given year if they cannot accumulate sufficient fat and protein reserves or if climatic conditions are not favourable. In particular, a heavy spring snow cover on the breeding grounds can limit access to feeding and nesting sites, therefore forcing some geese to forgo breeding. The nonbreeders lose their flight feathers in July and are unable to fly for about three weeks while the new feathers are growing. Breeding birds begin their moult later and regain flight capacity at the same time as their young start flying, in mid-August. The Greater Snow Goose lives quite a long time. By banding and tracking birds, biologists have determined that while the average lifespan is six years, many Greater Snow Geese live longer than 16 years. Greater Snow Geese have a number of natural predators: arctic foxes, arctic wolves, gulls, jaegers (birds that resemble gulls), Gyrfalcons, and ravens prey on the geese or eggs. Every three or four years, when lemming numbers crash, predators that rely almost exclusively on lemmings for food turn to goose eggs to supplement their diet. For protection, snow geese will readily nest near Snowy Owls’ nests. The owls’ intolerance of foxes and jaegers on their territory is beneficial to the geese, and owls seldom attack goslings. During moulting, birds usually remain close to ponds and lakes, which provide easy escape from hungry foxes. Because few people visit the nesting grounds, humans do not pose a serious threat to the Greater Snow Goose in the Arctic. A hundred years ago, the world population of Greater Snow Geese was estimated at approximately 3 000. 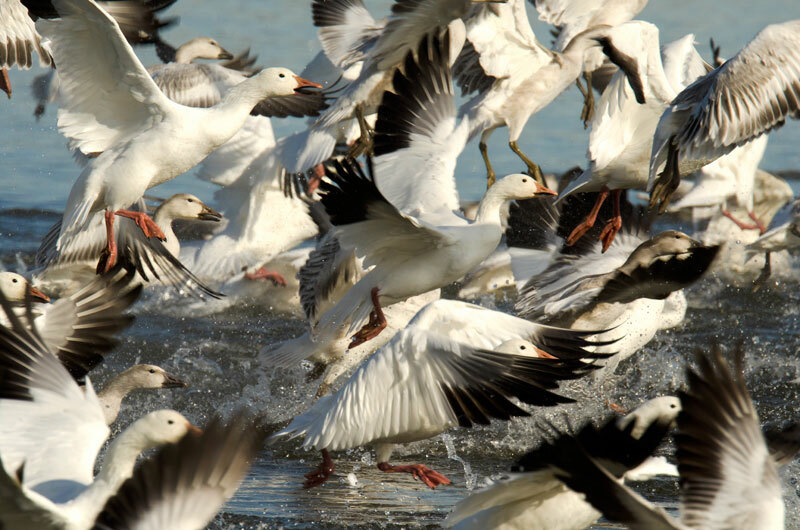 By 1998, there were more than 800 000 Greater Snow Geese. 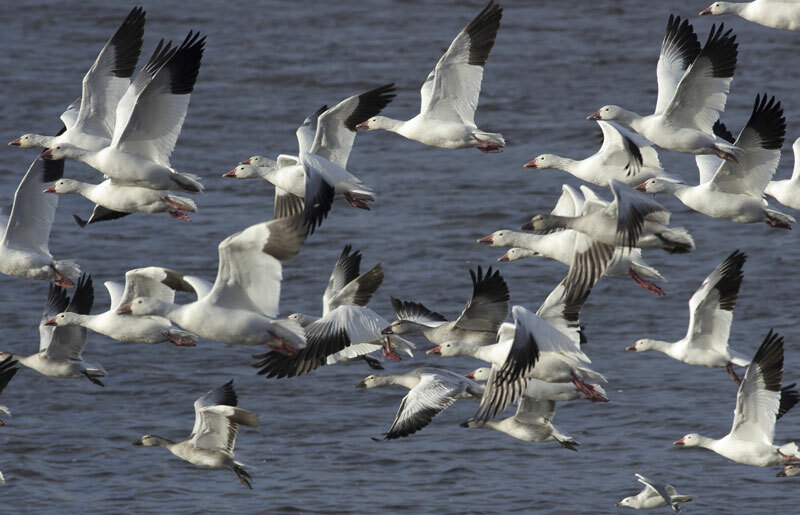 Most likely, three factors are mainly responsible for this dramatic increase: a change in feeding habits, the establishment of sanctuaries, and restrictions on hunting of the Greater Snow Goose. Before the mid-1970s, the Greater Snow Goose relied mainly on marshland vegetation for nourishment. Since then, changes in agricultural practices have led the bird to forage extensively in farm fields. In particular, the recent development of large-scale farming operations devoted to one crop, such as corn or cereals, have produced an unlimited supplement to the snow goose’s traditional diet and led to improved survival of the geese during winter and during migratory stopovers. The establishment of sanctuaries, where hunting is prohibited, as well as the protection of critical habitats in both Canada and the United States, have also contributed to the population increase. In Canada, the most important sanctuary for Greater Snow Geese is located on the St. Lawrence River at Cap Tourmente, Quebec, where the geese have traditionally stopped during their spring and fall migrations. In 1969, the Canadian Wildlife Service purchased a large tract of land at Cap Tourmente, making it a National Wildlife Area (NWA). In 1981, the Cap Tourmente NWA was declared North America’s first Ramsar site, a site recognized as a wetland of international importance. 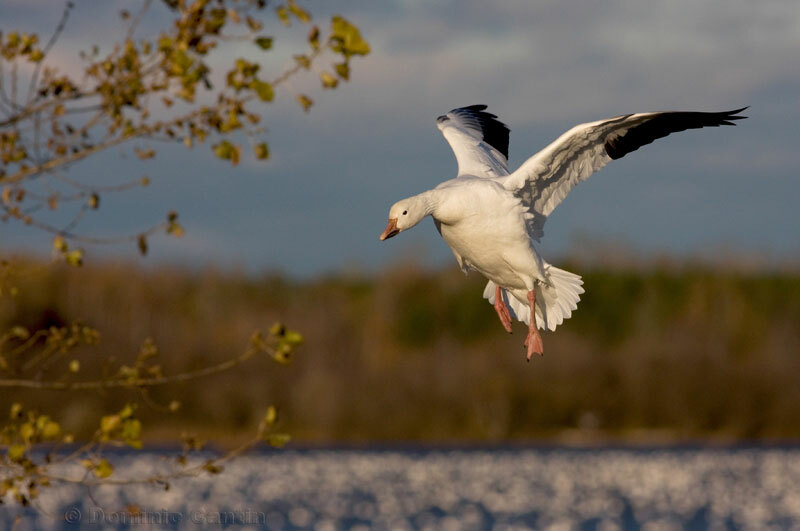 Each October, visitors can view up to 100 000 Greater Snow Geese feeding along the 10 km of muddy shoreline at Cap Tourmente, and they can learn about the Greater Snow Goose and its habitat at a wildlife interpretation centre on the site. 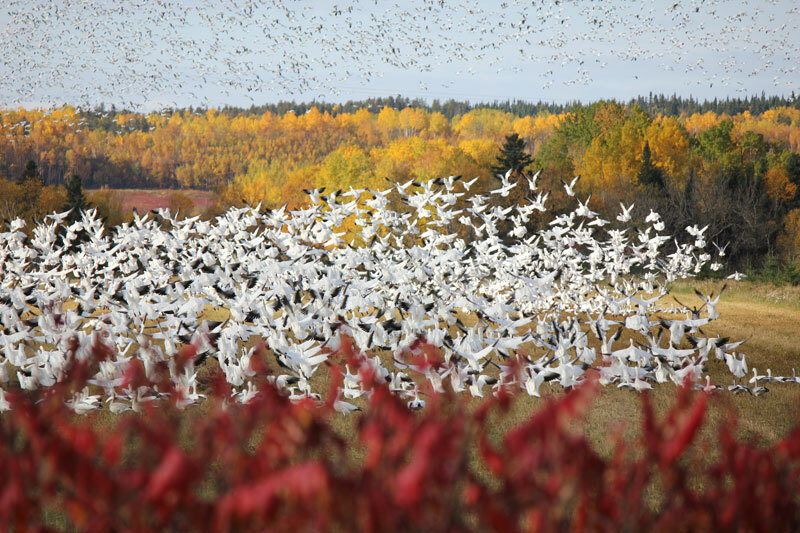 Large congregations of Greater Snow Geese can also be seen at Montmagny, where a significant snow goose festival is held in October each year. Bylot Island, which lies off the northeast coast of Baffin Island, and where the most important Greater Snow Goose breeding colony in the world is found, became a federal Migratory Bird Sanctuary in 1965. Bylot Island and adjacent areas on Baffin Island are also part of Sirmilik National Park, which was established in 1999. Such measures as the 1916 signing, by Canada and the United States, of the Migratory Birds Convention, which banned commercial hunting, and tight restrictions on recreational hunting appear to have eventually led to a sharp population increase between 1968 and 1973. When the recreational hunt reopened in the United States in 1975, the population remained stable until 1983, an exceptionally good breeding year which launched a more recent population increase. With Greater Snow Goose numbers rising as a result of these developments, wildlife biologists now consider North America’s snow goose populations to be overabundant. During the 1980s and 1990s, a subsistence hunt by the Inuit of the eastern Arctic and a fall recreational hunt in southern Canada and the eastern United States was permitted. Since 1999, a special spring conservation harvest has been permitted in Canada to reduce the harmful effects of these large populations on the Arctic habitats where the geese breed. The population increase has stopped and there are signs of a recent decrease—there are now about 700 000 Greater Snow Geese. 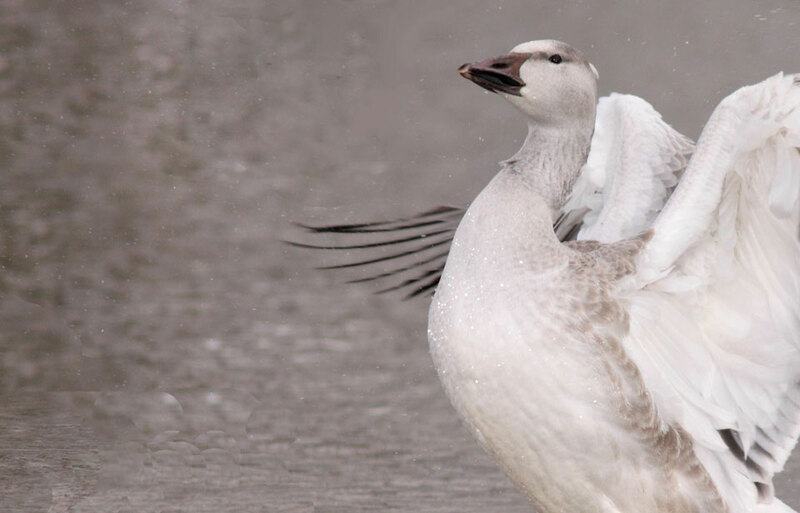 The Greater Snow Goose has been intensively studied since 1955 by researchers from the Canadian Wildlife Service, the Quebec Wildlife Service, Université Laval, Université du Québec à Montréal, and Université du Québec à Trois-Rivières. This collaboration between various research and conservation partners has allowed us to acquire a comprehensive knowledge of the Greater Snow Goose’s ecology during breeding, wintering, and fall and spring staging. This in turn allows sound conservation and management of the species. Batt, B. D. J., editor. 1998. 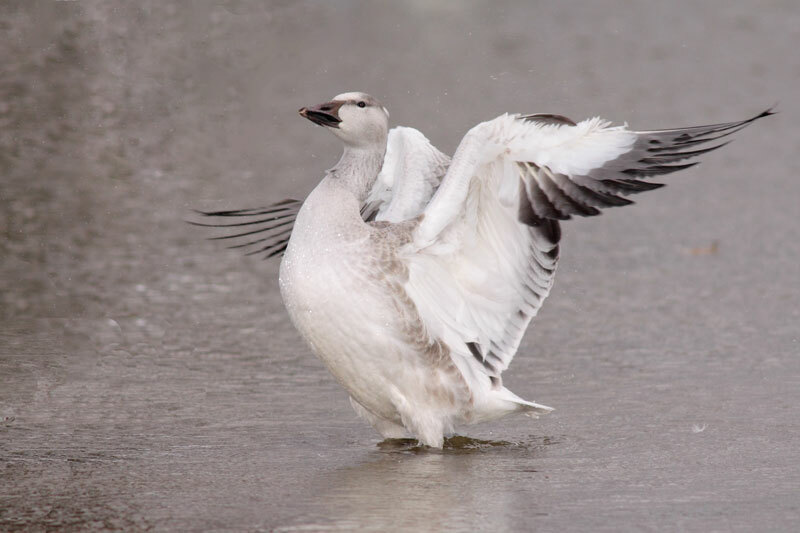 The Greater Snow Goose, report of the Arctic Goose Habitat Working Group. Arctic Goose Joint Venture Special Publication. U.S. Fish and Wildlife Service, Washington, D.C., and Canadian Wildlife Service, Ottawa. Lemieux, L. 1959. 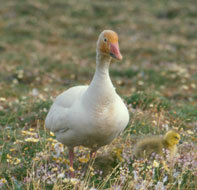 The breeding biology of the Greater Snow Goose on Bylot Island, Northwest Territories. Canadian Field Naturalist 73:117–128. Mowbray, T. B., F. Cooke, and B. Ganter. 2000. Snow Goose (Chen caerulescens). In The Birds of North America, no. 514. A. Poole and F. Gill, editors. The Birds of North America, Inc., Philadelphia, P.A. © Her Majesty the Queen in Right of Canada, represented by the Minister of the Environment, 1973, 1988, 1993, 2003, 2005. All rights reserved.